Want to bring a sack of potatoes to life? Any decent animator can do the trick. What’s much harder is to realistically imitate human motion, whether by recording actual movements and then translating them into digital animation, a process known as motion capture, or by programming human-like motion into a robot. 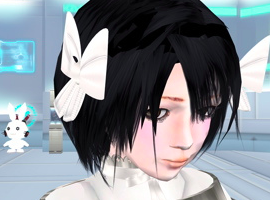 Complicating matters, avatars can also be too realistic. This phenomenon, known as the uncanny valley, was the subject of a recent talk at the New York Academy of Sciences by Chris Bregler, a motion-capture researcher at New York University, and Heather Knight, head of Marilyn Monrobot Labs. First posited in 1970 by Masahiro Mori, a Japanese robotics engineer, the uncanny valley comes from a graph of how our sense of familiarity toward robots changes as they become more human. The principle also applies to animation. The more lifelike the characters, the more the audience empathizes with them — but only up to a point. Bregler illustrated the uncanny valley with clips from two animated films from 2004. In Pixar’s The Incredibles, Elastigirl’s wide brown eyes and determined, straight-lipped mouth and Mr. Incredible’s larger-than-life tenderness translate to poignant, believable family scenes. Yet in Warner Bros.’ The Polar Express, the sympathetic grin of a young girl turns disconcerting. 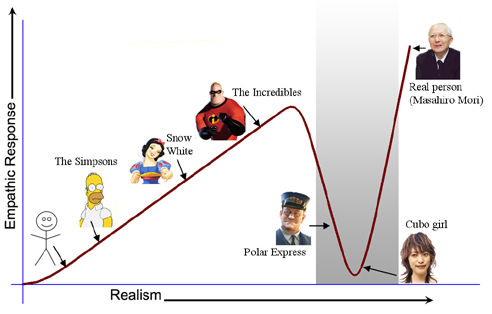 The Polar Express fell into the uncanny valley, the dip in Mori’s graph that represents the decrease in empathy we feel for animated figures as they become startlingly similar to, but not exactly like, the humans they imitate. The Polar Express, unlike The Incredibles, used motion-capture technology to translate the actors’ movements and facial expressions onto computer-animated characters. In motion capture, the filmmaker places around 200 sensors on a person’s body and a computer tracks how the distances between those sensors change in order to record three-dimensional motion. Animators can transfer that motion to a computer-animated human, as with the characters on The Polar Express, or to a creature, like Gollum, in the Lord of the Rings movie trilogy. A more recent example of motion capture is Steven Spielberg’s The Adventures of Tintin (2011). Does it make the grade? Dana Stevens at Slate has mixed feelings. Though motion capture is accurate, Bregler’s examples show that it doesn’t always produce a result we would want to take to lunch. The other speaker, Heather Knight, brought in a human imitation that clearly sidestepped the uncanny valley: a robot with a stand-up comedy routine. In a routine about Manhattan, the robot joked: “I am such a devout tourist that I have two video cameras installed in my face.” Though the robot, which stood about two feet tall, looked something like an astronaut (think Buzz Lightyear), its way of speaking and motions struck a chord of familiarity. During the reception, Bregler, whose lab does motion-capture work with dancers, mentioned another example of how human abstractions can seem more realistic than close imitations. Dancers, he said, feel more comfortable watching moving dots, representing the captured motion of a dancer, than they feel watching a computer-animated dancer based on the dots. “When you just see dots, you fill in a lot with the mind,” he said.